One of the common problems faced by those seeking the best router tables in the market is that of balancing the size and quality of the unit. High end units make use of laminated stress-skin tops that have sufficient space for handling even the bulkiest of pieces. However, these are costly and oftentimes, the lamination is not uniform. Considering this, it is refreshing to find a top company like Bench Dog claiming to offer high quality lamination, sufficient top dimensions and admirable features like an aluminium fence, without pushing the price to astronomical heights. However, this very price point can raise questions about router compatibility, stability and ease of assembly. Our detailed review seeks to understand whether the product, called Bench Dog 40-001 ProTop Contractor Benchtop Router Table, justifies such doubts or not. 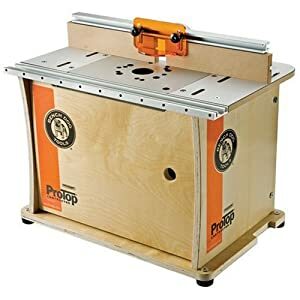 The Bench Dog 40-001 ProTop Contractor Benchtop Router Table comes with all major parts included, and one only needs to put together the tabletop, fence and base plate. Most users could assemble the unit within an hour while working alone and with only a standard Phillips screwdriver, and an Allen wrench. While most commended the company for providing simple assembly procedures and clear instructions, some went further and praised the inclusion of useful router tips as well. As most router table reviews would establish, a sturdy wooden tabletop is considered the epitome of durability and stability in the world of router tables, and it is good to see Bench Dog offering a Baltic Birch tabletop with high quality non-marring plastic laminate atop it. The presence of this laminate variant, coupled with the use of stress-skin construction procedure for finishing the tabletop, ensure that the unit never suffers from dents or unevenness. As an added plus, the thickness and natural strength of the wood prevent instability and/or wobbliness no matter the speed of the router or the size of the wood piece being handled. What really sets the unit apart, however, is the sheer amount of space offered. With 16”x22”/24”x16”to work with, most users found they could execute large and/or complex projects with astonishing ease. Such ease of operation is further accentuated by the presence of a high quality base plate that is not only compatible with a large number of router brands, but comes with predrilled router holes for easy installation of the router. These aside, the tabletop has twin steel rails to support the router, thus ensuring that the stability of the cut is further enhanced. In order to make operation simple, the Bench Dog 40-001 ProTop Contractor Benchtop Router Table comes with a single-piece fence frame. However, there are two wood sub-fences attached to the frame which ensure that the unit acts as a split fence offering the much sought-after zero-clearance feature. The fence itself is made of high grade extruded aluminium that is resistant to rusting and physical damage. The front and sides have been fully machined to preclude chances of there being irregularities and/or imbalances. The sub-fences are of similar quality and this, along with the inclusion of bit guards in the package, allow the user to operate the fence without worrying about alignment, stability or durability. Finally, T-slots have been predrilled into the fence in order to make mounting of featherboards easier. Continuing a tradition that is native to products of a far higher price range, the Bench Dog 40-001 ProTop Contractor Benchtop Router Table comes with a miter rail along one end of the router table. This rail can be used to mount a range of accessories including the miter gauge, as per the requirements of the project. Quite interestingly, regardless of the accessory mounted, the overall stability and usability of the table is not altered. Unlike other enterprises offering products in this price bracket, Bench Dog has managed to include a sturdy Baltic birch cabinet that boasts of an inside-cabinet height of 15”. The presence of a cabinet not only makes learning how to maintain a router table simple by restricting the spread of sawdust to the interior of the table, but also makes the operation of the table quieter. The size of the cabinet, on the other hand, ensures that no router would be cramped for space inside the unit. Enhancing the ease of maintenance further is a 2-1/2” dust port. The diameter of the dust port, as many users noted, allows it to accept the average shop-vac with ease and thus make cleaning the interior of the cabinet an almost automated procedure. Finally, the product comes with sturdy rubber feet that avoid slippage and add to the overall stability of the unit. The Bench Dog 40-001 ProTop Contractor Benchtop Router Table has been provided with a limited warranty of 2 years/lifetime warranty. Twin steel rails enhance the stability of router. T-slots allow for quick mounting of featherboards. No provision for router switch on the exterior of cabinet. Combining the virtues of a high quality tabletop and fence setup with the benefits to be had from a sturdy and easily cleanable cabinet, the Bench Dog 40-001 ProTop Contractor Benchtop Router Table manages to walk the thin line of efficiency quite well. Such efficiency, interestingly, is maintained regardless of the size of wood being used, the router inserted or accessories placed on it. Together, these provide a combination of versatility and efficiency that leaves little room for doubt. When the decent warranty and low price point are taken into consideration, these tend to make this Bench Dog product one of the must-haves for any user who needs fast and efficient cuts without having to worry about table durability and repeated adjustments.